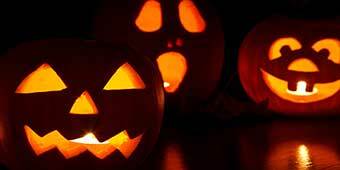 Each October American doorsteps are adorned with glowing, grinning pumpkins known as “Jack-O’-Lanterns”. Typically carved into ghoulish faces and illuminated by flickering candles, these hollowed-out gourds of the macabre were once meant to ward off evil spirits and are now visually synonymous with the spirit of Halloween. The best part? It doesn’t take a mad scientist to create one! So naturally, our friends at FIELDS Online Grocery Store decided to pluck one from the patch and give it a whirl themselves. Okay, it wasn’t perfect. But they had a ghastly good time performing pumpkin plastic surgery and bringing a little (extra) spook to the office. Plus they picked up some tricks and treats of the trade to help you concoct your very own Jack-O’-Lantern. Whether you’re a master wizard or just dabbling in the dark arts, this homebrewed pumpkin carving guide should bring a little fun and fright to your Halloween night. After finding a suitable operating table, use the marker to draw a deviant design on the rind. First time in the lab? Triangle eyes, nose and a jagged grin will do just fine. If you’re using a template, tape flat to the skin and puncture small holes into the outline, through the pumpkin, leaving behind a dotted trail. Use the large serrated knife to pierce the top of the pumpkin and saw (not slice) a circular opening around the stem. Hold the knife angled in toward the center so that the ‘lid’ will be slightly tapered and won’t fall into the belly of your beast. Not for the faint of heart! Grab the fleshing tool or spoon and scoop out the gobs of gooey guts. Never mind if the pumpkin pleads with you, all pulp, meat and seeds should be ripped from the host and set aside. Later, when that Werewolfish hunt for a feast inevitably hits, you’ll have deliciously fresh flesh ready to go. Once your pumpkin patient has been hollowed out, it’s ready to go under the knife. Use the smaller knife or carving tool to cut through the thick skin, revealing your creation. Once you’ve made the initial incisions, be sure to cut out all visible flesh so that eyes, nose, mouth and even ears are clear holes. You’ll need this to let the light shine through. A Jack-o’-lantern can only be fully brought to life when its ghastly glow ignites. Place a real or electric candle inside the hollowed-out head, replace the lid, chant your preferred witchcraft spell, and voila! Place on your doorstep or window ledge to attract trick-or-treaters – and admiring glances. Spirit-repelling effects are not guaranteed. Why would anyone carve a face into a gourd? For the spirit of it! The modern incarnation of American Halloween is a mystical night for anyone and everyone to enjoy. With communal traditions, no religious affiliation, and a built in set-your-own-level of spook, it’s a unique way to celebrate the changing seasons, each other and unleash your creative beast! Halloween items including Halloween pumpkins (large & small), FACKELMANN Pumpkin Carver, individually wrapped candies, Halloween hats & capes for kids and adults, ghost masks and more! Visit www.fieldschina.com and grab your favorite scary items now! Same day delivery in Shanghai, free for orders over RMB 200. Pay by cash or card on delivery or online using credit card, PayPal, Alipay or WeChat. next week "how to decorate a christmas tree !" oh boy !